The Texas Health and Human Services Commission and the Office of the Texas Attorney General will be conducting the investigation. If these allegations are found to be true, these horrible acts must be stopped at all cost and all involved must be prosecuted to the fullest extent. Next week I’ll attend the annual meeting of the American Legislative Exchange Council. I am currently serving as 2015 national chair, which has been a very rewarding experience. ALEC is where conservative policy makers, business leaders and think tanks come together to find new ideas, best practices and model policies. We pursue free markets, limited government and the realignment of state and federal powers. A quarter of America’s state legislators are members of ALEC. Together we represent more than 60 million constituents. Our Texas legislators will have dozens of learning opportunities and outstanding policy discussions next week. We will be hearing from several presidential candidates and more again at our winter meeting. I know they’ll bring great ideas home along with a lot of encouragement to keep up the good fight. For more information about ALEC, click HERE. 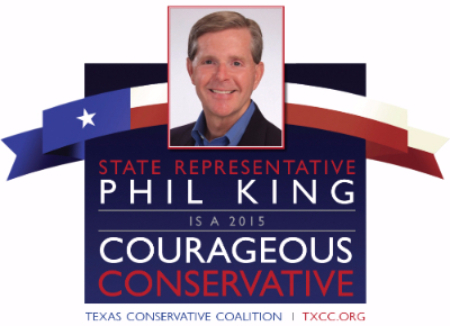 This week the Texas Conservative Coalition announced the legislators designated as “Courageous Conservative”. I am honored to have received this recognition along with a number of other colleagues.